The New Yorker: The Holly and the I.V. The New Yorker has a great article on how getting jolly for the holidays can land you in the E.R. As you might guess, chair and ladder injuries top the list, but there are the interesting outliers like damage done by holding lights or ornaments in your mouth while decorating. According to author, Professor Ben Wellington, the E.R. 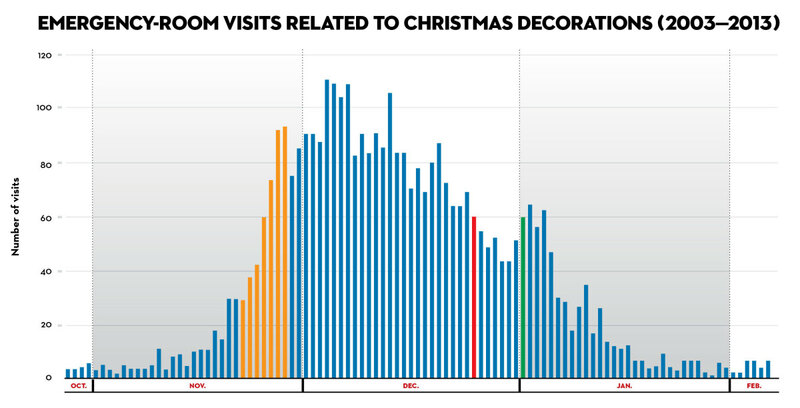 is busiest between December 4th and December 7th, which may correspond to the most popular decorating days. Another bump between New Year’s Day and January 5th may correspond to the days the decorations are removed. Traveling for the holidays has its pitfalls, but being home for the holidays is no guarantee of safety – particularly if you decorate for it. This blog belongs to me, Robyn McIntyre, and does not represent the views or policies of either the EMCC, any agency, hospital, or person involved in Public Health or emergency medical care services within Santa Cruz County. Any errors are solely mine.